Evolution has met with considerable religious opposition for 150 years and is still controversial among various religious groups. This article tries to understand the evolution controversy by reframing it as a phenomenon of public understanding of science. Three paradigms were used as hypotheses for the rejection of evolution by Dutch Protestant Christians: knowledge deficit, attitude deficit and trust deficit. 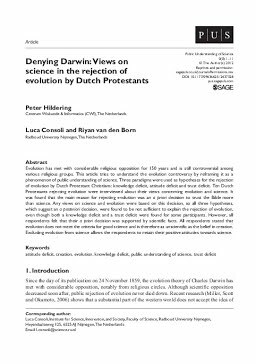 Ten Dutch Protestants rejecting evolution were interviewed about their views concerning evolution and science. It was found that the main reason for rejecting evolution was an a priori decision to trust the Bible more than science. Any views on science and evolution were based on this decision, so all three hypotheses, which suggest an a posteriori decision, were found to be not sufficient to explain the rejection of evolution, even though both a knowledge deficit and a trust deficit were found for some participants. However, all respondents felt that their a priori decision was supported by scientific facts. All respondents stated that evolution does not meet the criteria for good science and is therefore as unscientific as the belief in creation. Excluding evolution from science allows the respondents to retain their positive attitudes towards science.